Vi erbjuder flera olika kurser att välja bland. 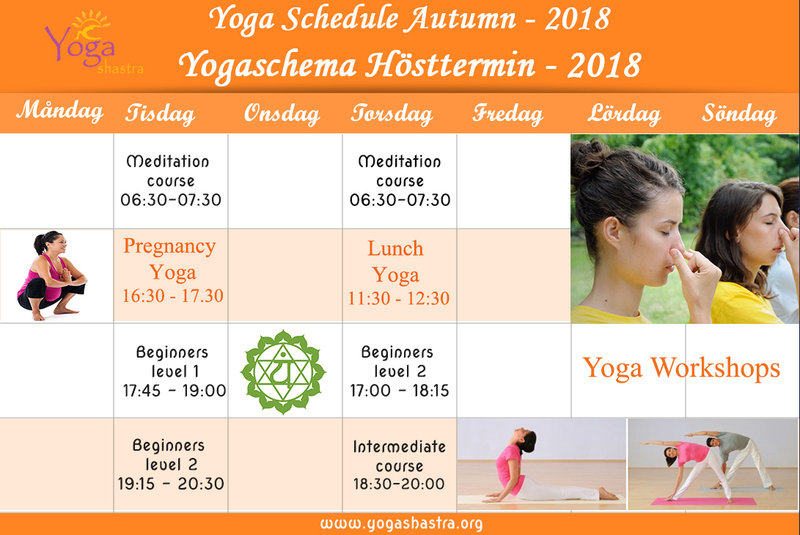 Våra yogakurser börjar från och med 21 augusti 2018! For you who are completely new to hatha yoga or wish to gain a clear knowledge about the fundamental principles of hatha yoga. We will have extra focus on gentle stretching and relaxation for body and mind. During the course, you will gain a clear knowledge about the fundamental principles of hatha yoga and be introduced to new asanas and yogic breathing techniques during the course along with their benefits, counter indications and proper technique. For you who have completed a Beginners’ course or already have some understanding of yoga. We will have extra focus on gentle stretching and relaxation for body and mind. During the course, you will gain a clear knowledge about the fundamental principles of hatha yoga and be introduced to new asanas and yogic breathing techniques during the course along with their benefits, counter indications and proper technique. Cost: 1750 kr for 16 classes. For you who have completed the beginners’ course or already have a good knowledge of hatha yoga. You will learn new variations and new asanas along with deepening your practice of the basic postures. We will continue to practice the headstand – Sirhasana. More focus on holding the postures comfortably for a longer time while being aware of your thoughts and breathing. Your teacher is Rajesh and classes will be in English. Pregnancy yoga is suitable for both beginners and experienced yoga practitioners – helping women enjoy their pregnancy with minimal discomfort, cultivate breath awareness and strengthen the body in preparation for labour. Yoga offers you the opportunity to connect with your baby, and the aim of the class is to feel deeply relaxed and connected your inner strength. And you can bring this relaxation and breathing techniques with you during your pregnancy, child birth and beyond. During the one hour class you will practice different breathing exercises, adapted Yoga asanas and Sun salutation, deep relaxation and meditation. You can join on the course at anytime and buy 8 times card or 15 times for full time course! We are starting our next beginner’s meditation six weeks course from Tuesday 28th August at 06.30- 07.30. This course is suitable for anyone wants to try meditation for the first time and also for regular meditators interested in exploring another meditation method. During the course, you will learn the basic principles of meditation and the techniques according to the Sivananda (traditional)yoga. The class will be held in the morning because that is the best time for meditation practice. We will start the class with Kriyas (yogic cleansing exercise), breathing techniques, gentle yoga asanas and then continue with guided meditation. In this six weeks, you will learn Breathing techniques, Yogic Kriya (cleansing exercise), Mantras and the basic meditation techniques. In this regular meditation course is suitable for anyone who already attended for the beginners meditation course or have some experince in meditation. During this one hour class We start with Pranayama (yogic breathing excercise) and some yoga postures and 20 to 30 minutes guided meditation. This classes are suitable for beginners to intermediates. This one hour classes will help to reduce stress, alleviate pain and tension in neck and lower back areas, ease out stiff joints, stretch out tight muscles, reduce fatigue and induce relaxation process. This classes are teaching Daniel Möller and Rajesh. You can buy 10 times card or 15 times card for the full course.